The SATeam Wrist Candy Holiday Giveaway has begun! 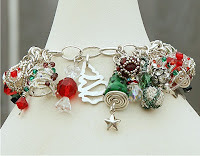 The talented members of the Starving Artists team on etsy have collaborated to make a beautiful Holiday charm bracelet. 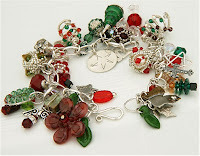 Our instructions were to create a Holiday charm using sterling silver and the colors of red and green. The charms have all been added to a sterling silver charm bracelet and are ready and waiting to be won. The FamiLee Jewels are proud to have one of their charms on this stunning creation. 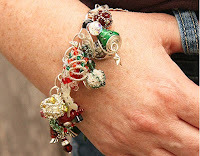 Between October 26, 2009 and December 6, 2009 any time you purchase an item from The FamiLee Jewels or any of the participating etsy stores your name will be entered into the drawing to win this beautiful holiday-themed bracelet, bursting with with charms hand-made by members of SATeam.